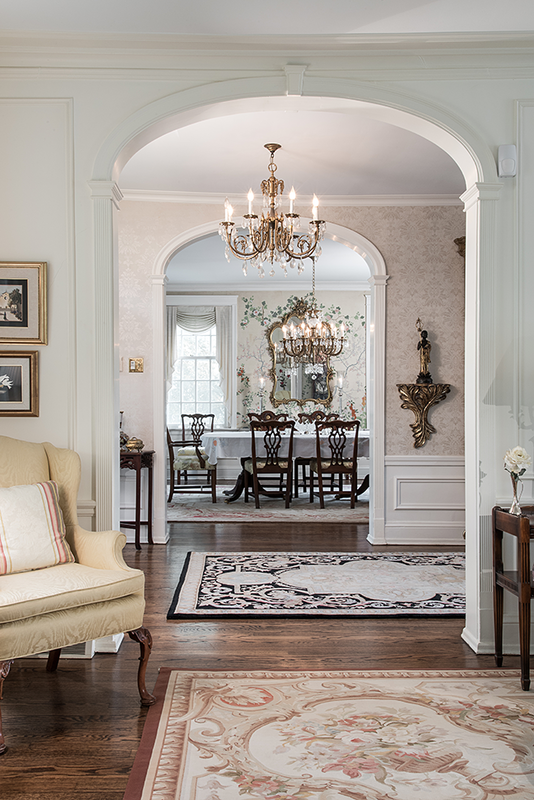 Architect Jane Ann Forney expands and unifies several prior renovations for these Ladue homeowners. 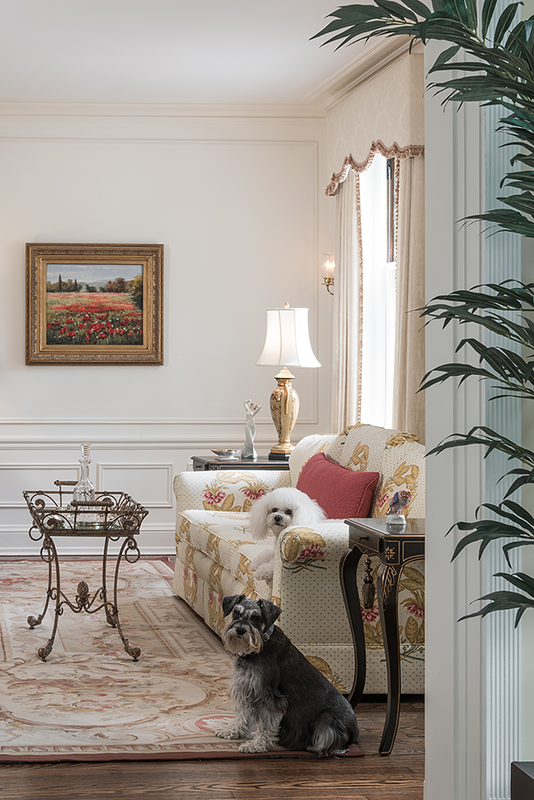 Poised to lead a tour of the elegant living room are Sophie and Gracie, the owners' Bishon Frise and Miniature Schnauzer. Original to the home, graceful arches with a keystone motif were repeated throughout the new additions to establish continuity. 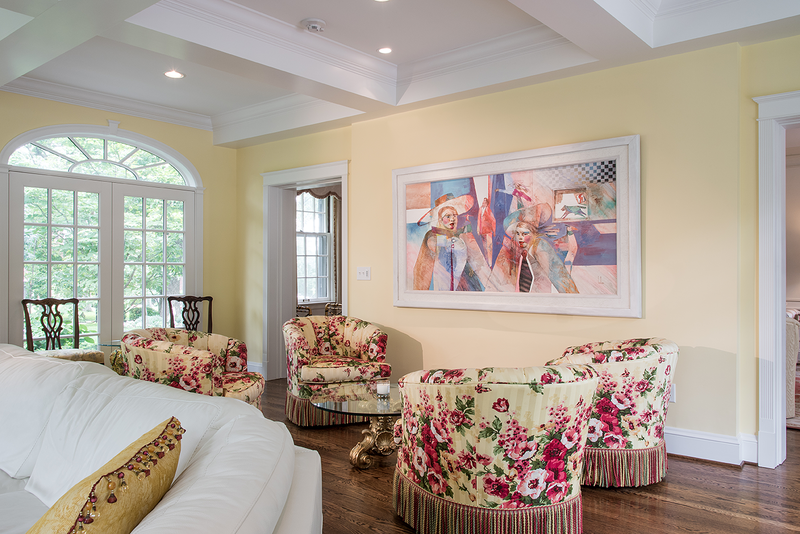 The former music room was expanded to create a cheerful, sun-washed family room. Classically designed, the fabulous outdoor recreation area was an earlier addition. Cramped for space, the original kitchen was converted to a butler's pantry that revolves around a free-standing center island and is conveniently located between the expansive new kitchen and the pub-styled bar. Open to the kitchen and hearth room, the casual dining bay overlooks the patio/pool area and adds a splash of warm color with furnishings from Expressions. Formerly the family dining room, the bar was transformed into a vintage European pub, with faux limestone walls, rich cabinetry, stained glass inserts, and a lintel invitation reading "Pax Intrantibus" ("Peace to those who enter"). Satisfying the husband's initial objectives, the second-floor master suite was vastly expanded to include a huge master bath, room-size closet, and a sitting area in the fireside bedroom, furnished with comfy overstuffed armchairs from Expressions. It’s often said that St. Louis is, in many ways, still a “small town.” Live here long enough and you’re bound to run into someone you know almost anywhere you go. For Kathy Cramer and John Davis, the fifth owners of this elegant three-story in Ladue, the colloquialism certainly seemed to hold true. Co-owners of The Cramer Institute, a St. Louis-based leadership development consulting firm, the couple purchased the residence 10 years ago. Built in 1926 and designed by well-known architect/author John Albury Bryan, the five-bedroom home had undergone a series of renovations over the years, but the various owners had essentially preserved its colonial style and character. Interestingly, the house already held many memories for Kathy. As a schoolgirl, she had been friends with the daughter of the third owners and had visited often. And the “small-town” connections with previous owners didn’t end there either. Soon after moving in, Kathy and John decided to add an outdoor entertainment area. Respectful of the home’s original weeping brick masonry and slate roof, the design was an award-winner, incorporating a bilevel patio with the concrete surface stamped to resemble slate, large planters flanked by pillars and carriage lamps, and charming fountains at each corner of the classically shaped swimming pool. Several years later, the couple agreed that it was time to expand. Laughing, they explain that they knew what they wanted, but their vision was rather vague. “it all started with John wanting a bigger master suite with more closet space,” Kathy remembers. Since the master is on the second story, “It had to sit on something!” John quips. Choosing an architect was easy. The fourth owners, from whom John and Kathy had purchased, were still neighbors and had built a new home just across the street.They heartily recommended their architect, Jane Ann Forney, principal of FORNEY + architecture, LLC. In addition to enlarging the master suite, Forney was assigned to convert the existing family room into a spacious kitchen/breakfast/hearth room and, in the opposing south wing, to expand the current music room for a new family room. Defining the challenges, Forney says, “It was like putting the pieces of a puzzle together – redesigning the spaces and creating a flow from one to another.” The couple chose Higginbotham Bros. as the custom builder, and her clients moved into the center of the house for nine months, while construction progressed simultaneously at both ends. In an earlier renovation, the original attached garage had been made into a large family room and replaced with a detached garage. 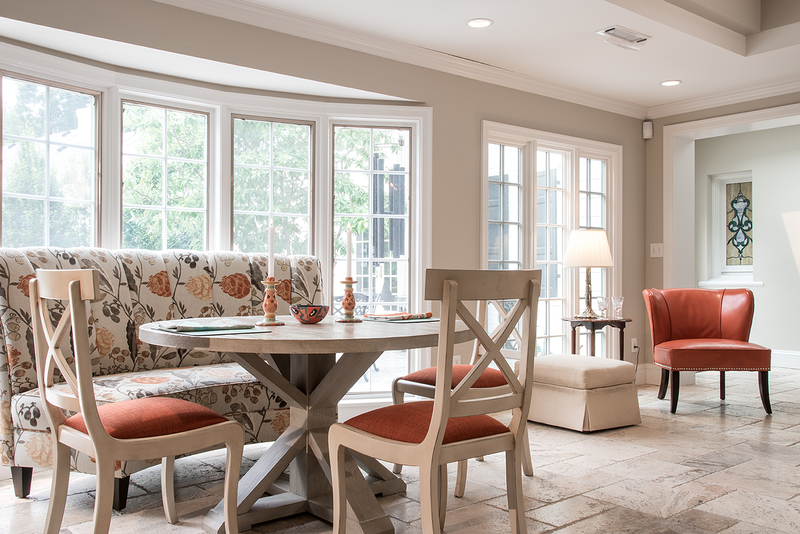 Forney transformed the family room into a bright, open space for meal preparation and informal dining, preserving the original bay window with its lovely views of the rear yard. The dark-brick fireplace was refaced with limestone; travertine tile was chosen for the flooring; and an extension was added, providing a generous china closet, mud room and pool bath. One of the owners’ favorite features, Forney tied the elements together with a dramatic covered colonnade that extends the full length of the patio/pool area and connects the home’s rear entry with the detached garage. Forney describes the kitchen’s styling as “transitional, leaning toward traditional, with a touch of European country.” Vast expanses of antiqued cream cabinetry are complemented by a bilevel, granite-topped island with curved overhang. Set in the sunny window bay, a rustic circular dining table is surrounded by chairs upholstered in burnt orange and a floral curved bench, lending a splash of color. In a nearby corner, an ottoman and two side chairs in the same shade create a cozy reading nook. 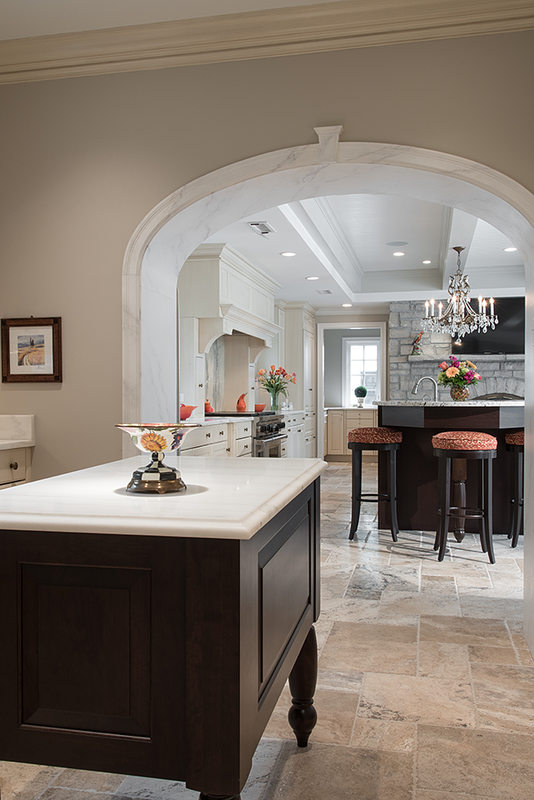 Trimwork surrounding the home’s interior arches has a keystone motif, and the theme was reinforced with a faux keystone arch accessing the butler’s pantry. Formerly the kitchen, this space now revolves around a work island, topped with marble and including a handy baker’s drawer. Directly adjacent is the bar (previously the family eating area), artfully appointed with faux limestone walls, antique stained-glass inserts and an entry header reading, “Pax Intrantibus” (“Peace to those who enter”). Virtually no changes were made to the foyer or formal living and dining rooms, which soar to 11-foot ceilings, retain their gleaming oak flooring and full-length windows, and were well suited to most of the couple’s preowned furnishings. 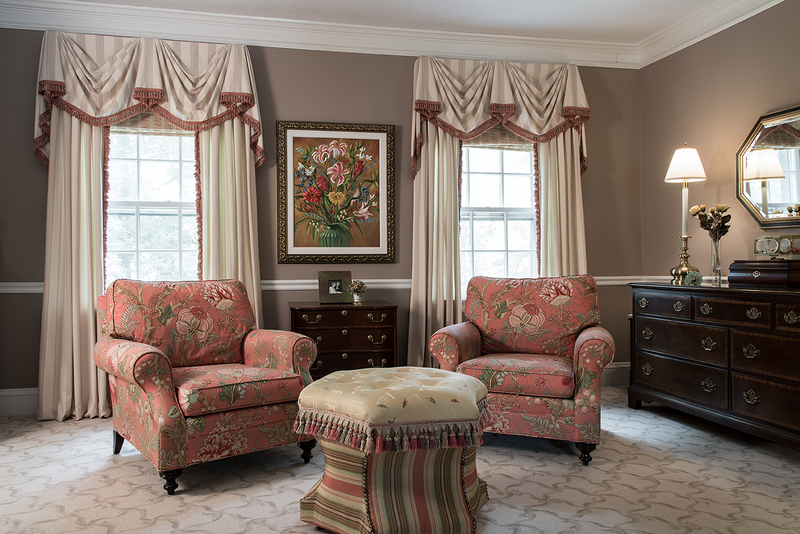 Kathy’s flair for color and interior design, however, are evident in her arrangement of the furniture and choice of several new complementary pieces. Expanding the former music room for a new family room was far more complex and required meticulous integration with the home’s existing interior and exterior features, including the weeping brick masonry and architectural windows. Forney’s masterful plan included a stunning box-beam ceiling to conceal the support beams necessary for expansion of the second-floor master suite. To duplicate the windows, she specified fixed and operable glass doors with elliptical transoms, then added a fireplace with marble surround and seamlessly matched the home’s existing oak flooring. Enlarging the dimensions of this wing also affected the symmetry of both the front and rear elevations. 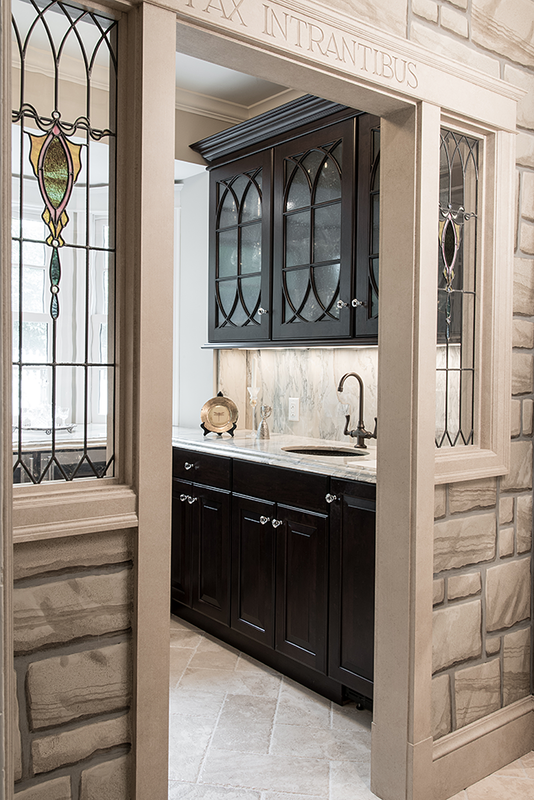 Forney solved this problem by adding a window on the family-room wall facing the street, decorative oval windows on the upper story and an amazingly realistic faux limestone “entry” on the exterior wall adjoining the patio. Kathy worked with Ann Tipton of Expressions on the family room’s interior décor, combining several comfy preowned chairs, upholstered in a bold floral, with a curved off-white leather sofa, sculptured area rug, vintage side chairs and unique rolling “tray” ottomans. Returning to the starting point of this massive endeavor, John’s wishes were fulfilled as well. The couple’s vastly expanded master suite adjoins a huge master bath and a room-size closet. Nine-foot ceilings enhance the sense of volume; warm cocoa-toned walls surround the bedroom and sitting area, and a fireplace with marble surround completes this luxurious private retreat. Now a fait accompli, this magnificent residence proves that a skilled architect can adapt a near-century-old home – even one that’s undergone several renovations! – to a more contemporary lifestyle, while still preserving its historic style and integrity.